As with every summer, the inevitable task of cleaning up the mess left by wintry weather is upon us all. 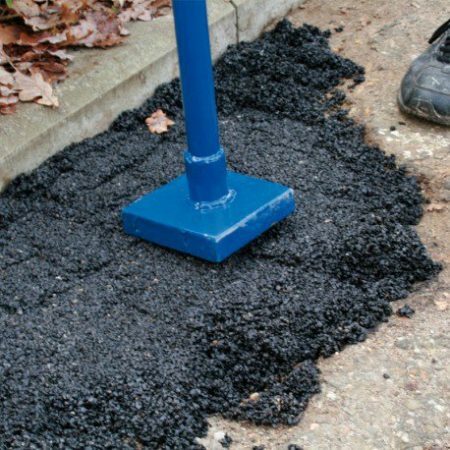 Unless you plan to ignore the problem, or call in a professional contractor, now is the ideal time to repair a damaged tarmac driveway and do some pothole repair work. This mission, should you choose to accept it, will look at cost effective ways to restore and rejuvenate aged or damaged driveways and car-parks, repair potholes, remove oil and chemical spill stains, as well as filling in depressed areas on the asphalt. This webpage will not self-destruct in 10 seconds. If you are mobile though and wish to see our asphalt repair systems immediately, they can all be found over here. Driveways might sound like grand entrances to country homes and stately castles, but if you have a garage or parking on a property, it is likely that you will have, to some extent, a driveway. The truth of the matter is that if your mobile phone is playing up, you’d call into the local EE, O2 or Vodafone store. If your electrics were faulty on your car dashboard, you’d pop into the local garage. If your roof was leaking, you’d call the landlord – if you are the owner, you’d probably call a repairman. So, if your driveway is damaged or in need of pothole repair work, it is very important to save costs now and get it repaired, rather than putting it off until ‘next year’. The age old saying about first impressions counting could not be more relevant for driveways on for-sale properties. If the drive looks pitted or is suffering from lots of cracks and small potholes, that could be the deciding factor for the persons viewing the property – before they’ve even stepped foot in the front door. It’s not just the prospective viewers though – damaged driveways don’t show off your property to friends, family and the neighbours. If the asphalt looks in poor condition, or there are potholes, now is the time to diagnose the problem and look into dealing with it. Driveway cracks are very common, especially in heavy duty areas (even a small family home where a car is infrequently used), or where the tarmac is exposed to a lot of sunlight, rain, snow, ice and other seasonal element cycles. There is no preventing the damage, but there are ways to pre-empt it and keep one step ahead. 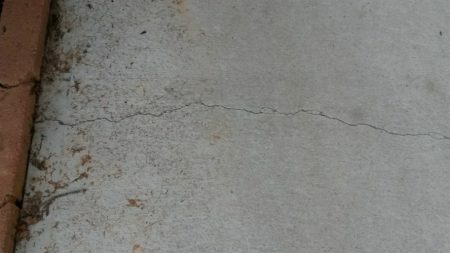 If you are needing to deal with cracks in concrete, read this article about concrete and garage floor repairs. If there are a small number of cracks, then now is the time to act and repair the cracks, as well as resealing the whole surface to protect the tarmac from the elements, moss, algae and weeds. Heavier duty cracks, however, can occur from tree roots splitting the asphalt or concrete. This can be a common problem in residential and council estate areas. The damage from tree roots could lead to the tree needing to be cut down, or its roots ‘removed’ as best as possible. Obviously, this is major renovation work and would require the whole driveway to possibly be ripped up and re-laid/resurfaced. Nobody likes to be walked all over, and whilst it’s the job of a driveway, it’s only fair that any depressions are dealt with sooner rather than later, before that divot in the drive becomes a pothole. Depressions and divots are slight lows in the surface and can occur when water has collected – like puddles or petrol/fuel spills. Depressions can also come from isolated settlement of the underlying foundation layer. They are very common and perhaps the most overlooked damage to a driveway. Quick and easy to repair, depressions and divots in public, residential or commercial car-parks should never be ignored. The cost to repair the damage could spiral and it’s best to pinch the problem in the bud. Be it in a car park, driveway, small in-roads or major motorways; cars do spoil tarmac surfaces with leakages. This is especially common from parked cars, where short or long stay car parking areas can accumulate lots of chemical or abrasive substance damage. Don’t simply look away from the unsightly stains – tackle them head on. Remember, if you’re looking to sell your property, or even employ a new member of staff, nothing is quite as off-putting as a dirty and damaged car-parking space. Chemical corrosion is one of the leading causes of driveway damage and it can be fixed. Blemishes to the asphalt can also be due to ageing. Whilst the structure may not be damaged, surface damage can lead to bigger problems, as the top layer softens and loses its robustness. Potholes are not isolated to commutes to work, which always seem to get hit every time Chris Evans gets a little too over-excited on his Radio 2 show. They can occur easily on car park surfaces and tarmac driveways. They are dangerous when ran over at speed and a major nuisance to any stretch of asphalt. Ask yourself – when you were in a public car-park last, would you have parked in a space with a pothole? So, we’re agreed they need fixing, and sooner rather than later. The areas around where you will conduct the pothole repair can become brittle, flaky and the impacting damage of a car driving over them at any speed can cause further spread of the hole – and the cost of repairing it. Fix small potholes as soon as possible, before you have to take your car in to be fixed too. Potholes in public, residential and commercial car parks need banishing to Room 101. Help that happen! 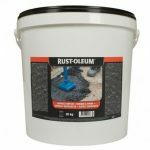 Ensuring there is no damp or moisture in the crack, fill the gaps with a bitumen based filler, like this one from Rust-Oleum. Small pits and fissures can be filled with a stiff mortar consisting of dry sand mixed with the product. Pits and fissures should be primed with the product before trowelling in the mortar. All crack repair products at Rawlins Paints come with full instructions and if in doubt, please contact a member of our help-team by phone or email for application advice. It’s best to cover the whole tarmac with a sealer to repair and prevent any further cracks. 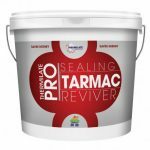 There are a range of sealants available, with Thermilate’s PRO Tarmac Reviver and Sealer being a popular one. 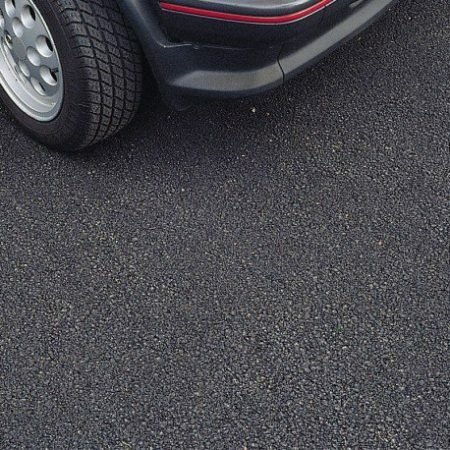 Available in black, red and green, replaces lost resins in the aged tarmac and can be applied in one-coat. Perfect for driveways, car parks and paths, it is a fantastic product for rejuvenating a tarmac surface. If the sunken area is too big, it may be easier to hire a contractor to fix the damage, but most divots and bigger depressions in asphalt can be fixed by yourself. Untreated depressions can lead to water pooling and seeping through the surface to the soil underneath. This almost ‘invisible’ damage can be very costly, as the whole driveway may need replacing for the underlying damage to be repaired. Don’t destroy the driveway by ignoring divots, depressions and sunken areas. All asphalt repair work can be a messy job and it’s advised to wear goggles and a face mask when preparing and doing the actual repair work. A proper repair job on sinking driveways involves cutting out the damaged area. It is not advised to fill it in or attempt to do a quick fix. This could cause more damage and incur more cost. Often on major roads and council estate streets, sunken holes look ugly. The best way to ensure that your work looks better is to cut out a square or rectangle shape. This way not only is it easier to get the damaged tarmac out – by placing a beam of wood around the area that has been cut and leveraging out the old asphalt with a pry-bar – but it’s easier to fill in, level and over a period of time, it fades to leave a more blended and professional repair job and not an unsightly stain. Repairing cracks, divots and depressions early can save you needing to repair a pothole. 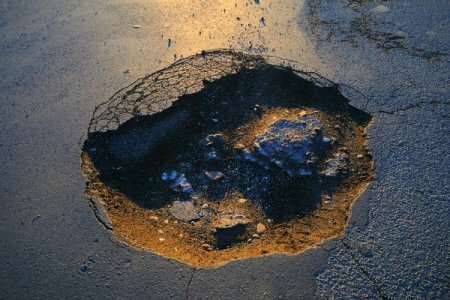 Cracks can widen and deepen, causing a crater like pothole in the driveway’s tarmac with even light to normal vehicular traffic. If you see a crumbling patch or cracks appearing, act fast, before it’s too late and some serious repair work needs doing. A thorough cleaning out of the pothole repair area will be required before any further work can start – more so than cracks and depressions. There will be more loose and unstable asphalt around the lip and pothole ‘walls’ to clear away than from cracks or divots. Using an abrasive brush and vacuum cleaner, clear out as much of the debris as possible, giving the repair work a firm surface to work and bond with. 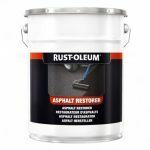 The two main products for pothole repair at Rawlins Paints are both from Rust-Oleum. The 5410 Asphalt Repair bitumen-based repair material is a durable product for use on both asphalt and concrete potholes. So, whether the pothole is on the driveway, path, car park or road outside your home/work-place, this repair product will be able to withstand heavy traffic almost immediately. Suitable for holes up to 100mm, it comes with a primer included. 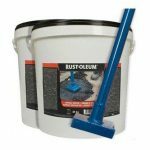 For patch repairs and more shallow potholes, Rust-Oleum’s asphalt repair starter kit currently comes with free delivery, here. Also included is an application tamper, for compacting the patch into the pothole and levelling the surface. Most tarmac revivers and sealers are non-yellowing and UV stable. They will assist the aggregate bond with the adhesive properties of the resin and reduce colour fade. Remember that it’s not just the application of a driveway sealer that’s important, it’s the drying (curing) time of it too. Ensure that work doesn’t finish just as traffic on the driveway starts or a downpour is due. Different sealers by different manufacturers do come with different application techniques and drying times. Most products online come with datasheet advice and further manufacturer recommendations. Working on one section at a time and starting from a corner, pour the asphalt driveway sealer onto the surface. The sealant can often be spread and layered with a brush, roller or squeegee. Ensure that layers overlap each other to ‘level’ the sealer. Be sure to respect the coverage rates of the product and take care not to over or under apply each coat. If necessary, mark off the area with tape, signs or bollards, so that no-one drives or walks upon the drying surface. You may need to apply two thin layers, rather than one thicker layer – product and manufacturer recommendation dependant – so plan around the locale with sufficient drying time between coats. 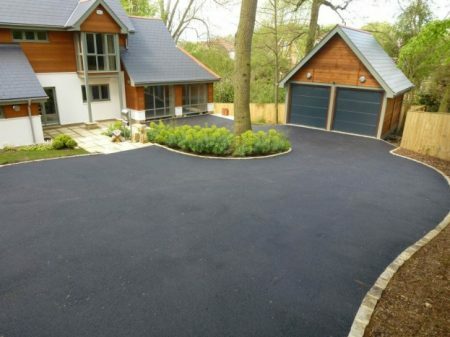 Getting the correct sealer can also depend on the age of the asphalt, so if you are unsure which to use, give us a call or drop us an email at Rawlins Paints, and we’ll help you repair the ‘ground breaking’ damage. Line-marking and disability sign marking paints are available here for asphalt and concrete. Rust-Oleum’s Tarmacoat – a water based, flexible acrylic exterior paint available in blue, green, yellow, red, and more, is available here. Masonry paints and sealants for adjoining brick or retaining walls are available here. I want to redo my driveway because it is starting to sink in some spots. Thanks for the advice about how if the sunken area is too big you should get a contractor to help you. Another thing to do is to make sure you get a contractor that is licensed. Thank you for describing the best way to fix potholes. I will definitely be buying the products you mentioned for the repair. I have attempted to fix the potholes a few times but with no good results. If it doesn’t work this time I will be hiring a professional! Pressure washing the surface was something that would help repair a pothole. It does seem like it would help you know just how big and deep the hole is. I am not sure that I would be able to repair it myself because I am very busy. It seems like it would be better to have a professional do it for you. Great advice for repairing a cracked driveway. It seems so much easier than I would have thought. Thanks so much for sharing! Nice, I learned so much information. I saw cracks on the pavage asphalte driveway. Since, I know now how to repair it. I think i’ll start tomorrow. There are so many potholes along my street and I really think it’s becoming a hazard to all the drivers and their cars. I like how you point out that you should fix small potholes as soon as possible. Right now the ones on my street are fairly small, but I think having a professional come and fix them immediately will make all my neighbors very happy. These are great tips on repairing your driveway. I’m glad I ran into this. Sometimes it’s just better to fix the minor problems you have with your driveway rather than to let those small cracks and holes turn into huge problems that will have you calling up a contractor to replace the whole thing. Pay a few bucks and spend a little time maintaining or spend a huge amount later on from lack of it. I love this advice! I have always thought I could repair a pothole on my own and now I can finally try. I thought it was really interesting how the article mentions that cracks in your asphalt can become problematic. My wife and I are looking to sell our home soon but noticed some large cracks in the asphalt of our driveway. I think it may be best for us to call an experienced paving company that can fix our cracks the right way and make our home more appealing to sell.